For a professional chef or a home cook, choosing the suitable pots and pans for your cooking requirement is an individual choice. A lot of options are available and different factors are to consider in choosing the right one for you. Some of the considerations are the frequency of usage, dependability, comfortableness, safety and versatility. Another consideration is whether it is wiser to buy single pots & pans or to buy pots and pans set. If you cook limited dishes for yours and your family’s consumption, buying single pot and pans may prove to be more economical. You may do a lot of different dishes on a single reasonably sized pot. Do not but a small pot as you are limiting its capacity as to the quantity and the types of dishes you can prepare in it. As for pans, a small and bigger pan may be recommended for a few varieties of dishes, from simple frying to more complex dishes. You may also want to have some stainless steel pots and pans and some non-stick ones. You can find some good quality but cheap pots and pans which are suitable for everyday home cooking. For professional chefs or cooking enthusiasts who are more daring in preparing more varied dishes, buying pots and pans sets may be better and more cost friendly in the long run. It also saves you the hassle of not having the right cookware when you need it for your particular recipe. Cooks of this type prepare dishes that range from seared meats to paellas so a wide variety of cookware is very much welcome in their kitchen. Now there are also ingredients which are only suitable to certain types of cooking ware. Example is tomato or lemon which is acidic and may react negatively on cookware with copper finish or aluminum finish. Your best bet for acidic ingredients is stainless steel pots and pans set. Stainless steel metal is non ferrous and non corrosive so it does not react with food ingredients. This ensures the flavors of your ingredients do not get tampered with any metal taste. Another option is glass cooking pots and pans which are surely non-reactive but has limits as to the type of cook top you will use. The cast iron pots pans is an excellent option for cooks who are more into frying. Cast iron has a good heat retention lessening the time required for you to achieve the brown crisp you are aiming for. Cast iron cookware needs to be seasoned, though, prior to first use and this has to be repeated once or twice a year. Ingredients will not stick to a well seasoned cast iron cookware thus is easier to clean compared with using stainless steel. 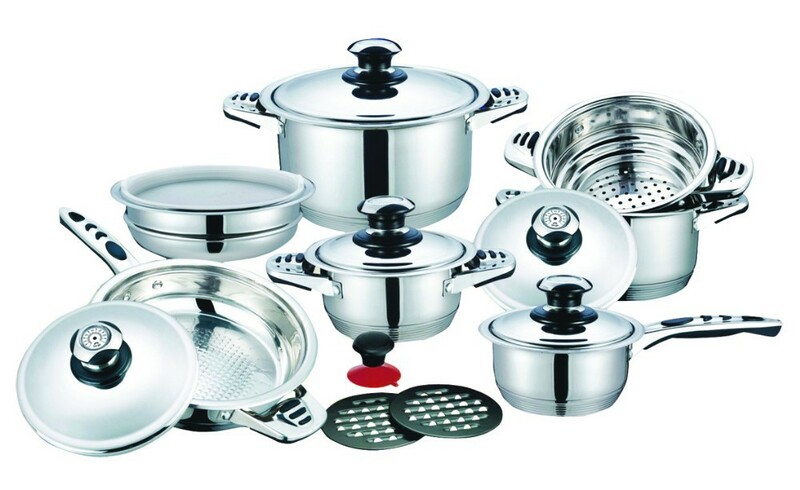 For more complicated type of cooking which involves both a cook top and an oven, one consideration you have to bear in mind in selecting your cookware is the handles of your pot and pans set. Take note that you have to transfer a hot pot or pan into the oven which is presumably pre-heated. Your handles must be easy to grip and safely attached to the cookware itself. It is also better that the handle stays cool even during cook time. Do not rely on kitchen pot holders as you may underestimate the hotness of the handle if it is not the stay cool type. The best pots and pans for wannabe chefs is a mixture of different types. This way, you get to try each and know which one works well for each type of dish you are preparing. For sure you will have favorite pots and pans over time and from this you would know which will be your next buy. Discovering the versatility of your cookware will trim down the pieces you would need to buy. Discovering also which wears down easily with your cooking frequency will enable you to be more cautious on your next purchase. If you’re the artsy type, you may also want to try colored cookware like green pots and pans or pink pots and pans which are now available in the market. To get the best value for your money, before deciding the cookware pieces you would buy, make sure you contemplate on what you really need. Think about what you regularly cook and what dishes you still want to try. Do not just imitate what others are buying or be fooled into buying the most expensive ones thinking it is the best or cheapest ones thinking you are saving money by doing so. 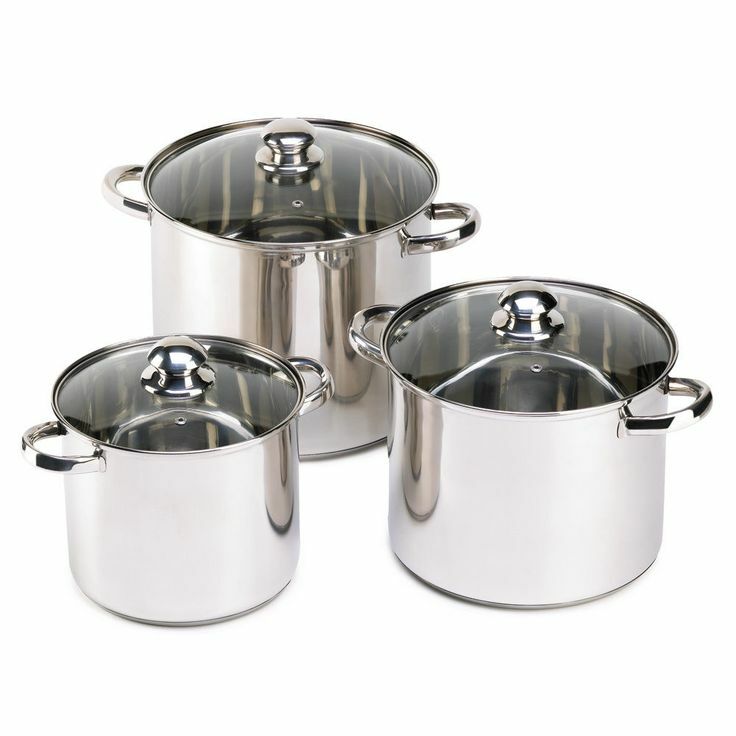 Note that some cookware is made for rigorous cooking like in catering or restaurants and for this reason the cookware are reinforced and therefore cost higher. In the same manner, not all cheap pots and pans set are of inferior quality but you have to choose wisely because the possibility of getting low quality cheap cookware is high. Doing a good research may save you a lot of bucks and having unnecessary cookware in your kitchen. Businesses related health and well being are now booming nowadays because people are now becoming health conscious. The proliferation of illnesses ranging from grave ones like cancer to more common ones like diabetes and obesity are being addressed now. People are more aware now of the saying “prevention is better than cure” and many are changing their lifestyle to prevent getting these dreaded illnesses. When we say lifestyle change, one of the major factors to change is one’s diet. People now are trying to lessen eating food with high bad cholesterol food. As we all know, pork, beef and chicken and some of their by-products have fats that contain bad cholesterol. The dilemma, however, is how to avoid this bad cholesterol without having to totally sacrifice one’s taste buds? Cookware manufacturers are aware of this and have since introduced the nonstick cookware. Traditionally, when we cook, we are always smothering butter or edible oil onto our cooking pans. Without having our meat yet, we have already placed extra cholesterol in our dish. A single cup of oil and butter has over 1000 calories. The question is, why do we have to put these automatically into our dish and how can we avoid it? When we cook with even the best pots and pans manufactured the traditional way, our ingredients stick to it if we do not put first oil or butter. This is what nonstick cookware sets solve. 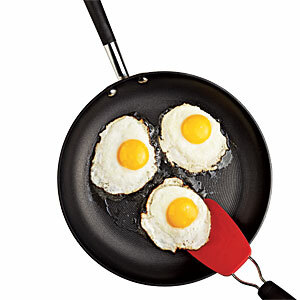 The nonstick cookware brand that made this type of cookware popular is the teflon pans. Using this cookware, even minimal or without butter or oil, your ingredients will not stick to the pan thus minimizing cholesterol in your dish. Now, you can enjoy your meat better and with less guilt. Of course, to have energy in our body, fat intake is still necessary but it should be within the healthy limits. When you cook meat in a stainless steel cookware, and not oil or butter it up prior to putting in the meat, it would stick onto the pan and you are left with big trouble cleaning up the cookware after use. Unlike with a nonstick cookware set, cleaning is a breeze. In fact, you should not use rough cloth to clean a safe nonstick cookware as it may damage the nonstick coating. Having mentioned the nonstick coating, there have been claims that the original materials used as nonstick coating has a negative effect on one’s body, there is no scientific or medical evidence to back these claims. However, to make consumers feel safer with the best nonstick cookware, manufacturers have developed different non stick cooking ware made of other materials. Examples of these are the recent releases of ceramic nonstick cookware, green nonstick cookware and hard anodized cookware. To make your nonstick cookware last for years, appropriate care and maintenance should be observed, as with all types of cookware. A nonstick cookware safety leaflet is normally provided when you buy the cookware. If you follow these safety precautions, cleaning and proper usage procedures, your cookware will work for you for a long time. If you’re up to preparing hearty but healthy dishes, you should definitely try nonstick pots and pans. Not only will it be beneficial for your health and your family’s, it also lessens your burden of cleaning up giving you more time to enjoy your health lifestyle. If you ask what the best nonstick cookware is for you, it actually depends on different factors. Check out different cookware reviews as they could guide you which cookware is the right one for your cooking requirement. There are a lot of different brands to choose on and different price ranges to suit your budget. The expensive ones do not necessarily mean they are the best type. Sometimes the expensive ones are built for restaurant cooking where the frequency of cooking is much more than in a regular household. There are some cheaper ones that are also of good quality.